Cordelia Grant, an English student at an exclusive finishing school in Switzerland, is enjoying her final term and looking forward to going home to her beloved aunt Patty and working as a schoolmistress. Cordelia and her friends decide to go on one last adventure together after hearing the local legend set during the Hunter’s Moon. It’s said that in a certain spot in the forest, one’s future husband will make an appearance. Not truly expecting an apparition, the girls are shocked when a young man steps out of the trees and sits to talk with them. He seems to give special attention to Cordelia, and when he takes his leave the girls all agree that it seemed an unusual encounter. Not long after, Cordelia was on her way home to England. Finding much pleasure in her occupation, Cordelia flourishes at the girls academy where she teaches English, literature and social graces to girls not much younger than herself. Her world, however, darkens when the local lord and landowner, Sir Jason Verringer, begins relentlessly pursuing her. Not only does he have a reputation as an unapologetic rake, but there are rumors that he hastened his wife’s death to be rid of her. Cordelia, a master verbal duelist, is able to hold him at arms length for a while, but soon finds herself fascinated and looking forward with pleasure to their emotionally exhausting meetings. Events, nonetheless, change her attitude quickly as she soon finds not only her livelihood in danger, but the lives of those she loves. 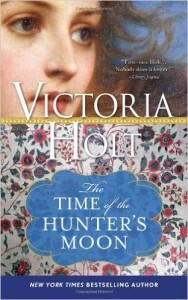 It has been said that Victoria Holt lost her touch with the believably of her plots in her later years. This particular title is her 22nd Holt novel, published in 1983. As a veteran Plaidy/Holt reader, I found it equally immersing, witty and inspiring as her earlier reads. Though I had some ideas on the mystery and previous experience hinted the friend-versus-foe aspect, it didn’t turn out exactly the way I’d have thought, and there were several questionable characters to ponder. The atmosphere of the story–on the ruins of an ancient abbey–is the perfect setting for a Gothic tale with a smart, level-headed protagonist. The Time of the Hunter’s Moon is without a doubt a rival to Holt’s first novel, Mistress of Mellyn, which was published in 1960 and thought to be penned by Gothic Romance’s leading lady, Daphne du Maurier. Though there is no year mentioned, there are several clues to point to early turn-of-the-century rather than late 1800’s, and so I have categorized it with 20th century reads.